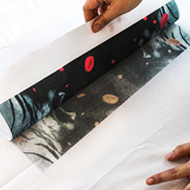 Transfer printing is the term used to describe textile and related printing processes in which the design is first printed on to a flexible nontextile substrate and later transferred by a separate process to a textile. A means of transferring a design to a substrate using an intermediate step. In heat transfer printing, a design is printed in reverse on a special release paper using a plastisol-based ink (or other type of sublimable dye). The printed image is then placed against the desired substrate (commonly a fabric, such as a T-shirt) and subjected to high temperature (commonly 375ºF) and pressure (60 pounds) for a short period of time (12:15 seconds is common). After the substrate has cooled, the release paper is peeled away and the image will have been transferred to the substrate. This process is commonly used for "iron-on" decals. Also known as screen flex heat transfer. Variations on the above include lithographic flex heat transfer, which is a process for the heat transfer of photographs. The primary difference is that the image is commonly printed on the release paper by means of offset lithography. Nylon heat transfer uses a specially-formulated screen printing ink designed to adhere to nylon. Screen glitter heat transfer involves the use of glitter inks to provide a glittery, disco look to the final printed image.